Sir Robert Laird Borden (June 26, 1854 - June 10, 1937) was the eighth Canadian Prime Minister, and served during World War I. Born in Grand Pré, Nova Scotia, Borden was the son of Andrew Borden and Eunice Laird. He was a lawyer by profession, called to the bar in 1878. Borden was elected to the Canadian House of Commons first in 1896 and would become leader of the Conservative Party in 1901. He served as Leader of the Opposition until 1911, when the Conservatives won the election of September 21. With the beginning of World War I Canada was ill-equipped to fight the new modern type of warfare, and the Total Armed Forces strength was under 4000 men. Borden supported Canadian Industries during the war, including the poorly designed Ross Rifle which often jammed during the fighting in France. Canada also under went a number of changes at home, with the introduction of a "temporary" income tax, and the nationalization of the bankrupt Canadian Northern and Grand Trunk Railways. Borden's most controversial act was the passage of mandatory conscription of men for the Armed Forces, widely unpopular in Quebec. Following World War I Canada was no longer a colony of Great Britain as at the start of the war, but recognized for it's contributions and the building of a national character. Over 626,000 Canadian fought and 68,300 died in service. Borden led the Canadian delegation at the Paris Peace Conference. 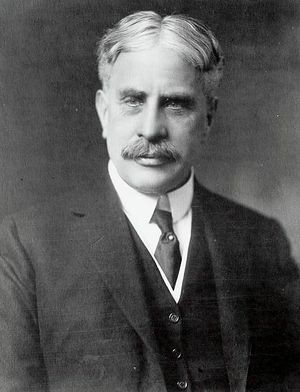 Borden resigned from the Office of Prime Minister on July 10, 1920. Sir Robert Borden is pictured on the Canadian One Hundred Dollar Bill. This page was last modified on 12 January 2018, at 14:29.